You are here: Home > Topics > Power Tools, Pneumatic Tools, Hand Tools and All Things Tools > Tool deal discussions and rules? Tool deal discussions and rules? This topic contains 24 replies, has 9 voices, and was last updated by Doobie 5 months ago. I saw in some older threads that we are not supposed to discuss tool deals. Can someone explain to me why this is the case? I try to do a search to read up on some background but didn’t find much. I am looking to expand on my tool line up and thinking of taking advantage of the upcoming Black Friday deals and specials. Quality, compatibility, usability, durability etc… are all important but price is also part of the consideration. 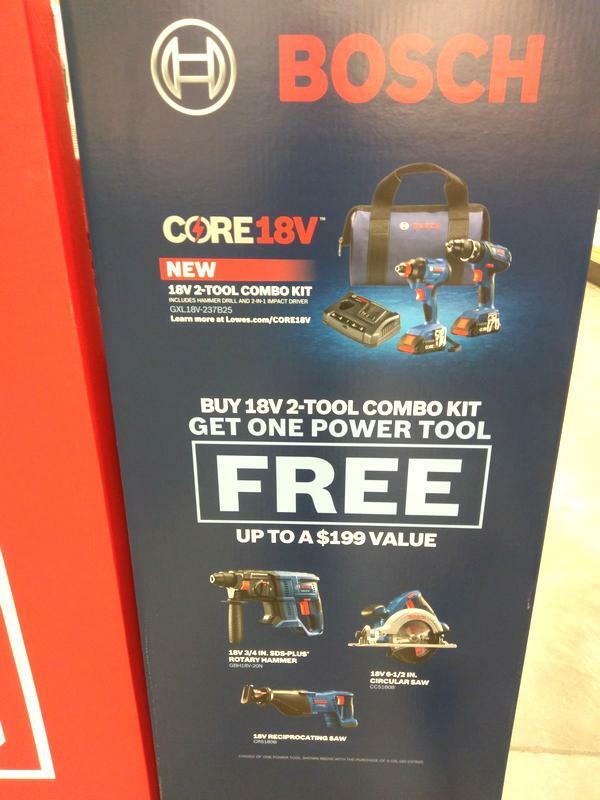 Are Bosch tool deals an exception to this rule or this applies to all brands including Bosch? For example, currently I am looking at a few Bosch combo kits at Lowes. Can I start a thread to discuss specific combo kits and compare them in various ways and ask about opinions including prices? Or not? Thank you. If you buy it, you can post in ‘I bought a Bosch….’ or ‘Tooaholic’, thread as appropriate. But seeing a sweet deal online or wherever you just want to alert people too, that’s a nono although once in a while someone will break it for something truly exceptional going on. They just didn’t want this place to turn into an advertising billboard in some respects. I have to agree with that. I could actually see some members joining who could end up doing almost solely that and meanwhile they are paid product promotion people. Just too many hassles to openly allow it. Even when you want to just show a product, they prefer you use manufacturers websites product pages versus using those on retailers websites or just simply find a stock photo to post. We have to wonder with no one sailing this ship are there any rules now?? I am looking at two Bosch combo kits right now. One is a 4pc one a 5pc. Just like any combo kits I only have use for half the stuff in these kits since I already have existing tools, and of course the only reason to buy the kit is it’s about same price as buying only the individual tools I need, but seems like if I post my questions it would sound like a deal an analysis or deal comparison. Combo kits like you are describing can be a great thing. Some of the pros are that you get a bunch of tools on the same battery platform, and, if you already have a similar tool, well, tools break/wear out. It’s a tough day when something lets you down and you don’t have a backup. Particularly when you could have got said backup for basically nothing. Multiple drills are always nice if you are boring different size holes. I have a counter sink chucked up in one of mine always. The other does the drilling, and the driver does the driving of the screw. It’s a handy system. OK here is the Bosch combo kit I am considering. If this is a violation of rule let the mod knows to delete it or whatever. 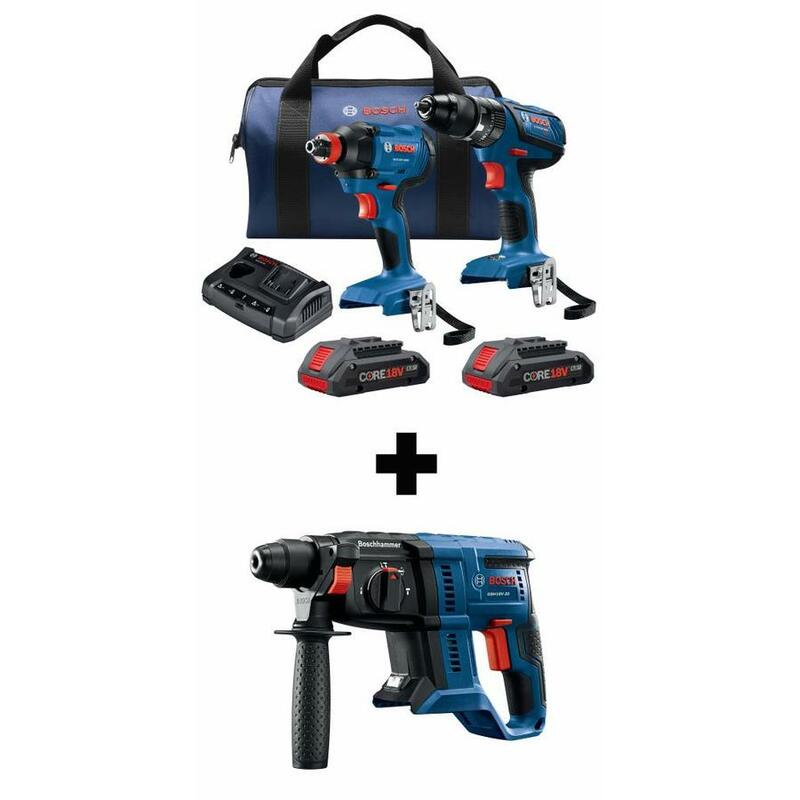 Lowes is running a special on this Bosch combo hammer drill/driver kit. This is the combo kit. I don’t need a 18V hammer drill, I already have two (M18 and Ridgid) 18V and one corded (Makita), but may be the Bosch one will perform better? No idea. I don’t need an impact driver either. I already have an M18 one I am pretty happy with and a Ridgid as a back up. I recently won a Freak from Bosch…so I don’t know if this GDX18V-1600 is better than the Freak? The Freak kit came with a 6.3ah core battery, which is too big and heavy for an impact. So why buy a kit if I don’t need the kit LOL? Well it comes with two 4ah core batteries. That is useful if I expand into the Bosch cordless platform. I could use these batteries with the freak, although so far the freak is under-performing. From the picture, it comes with a charger that can charge both the 12V and 18V batteries, so that’s useful if I get some Bosch 12V tool. But more importantly the free tool selection include a rotary hammer model GBH18V-20N. I looked up Amazon and it says this bare tool by itself is $217. Only $3 less than the whole kit. So it comes down to this tool. I don’t have an 18V rotary hammer, right now my GO TO hammer is a CORDED BOSCH SDS+ Xtreme Bulldog. Is the GBH18V-20N comparable or even better? If so, I can pair it with the 6.3ah battery from the Freak kit and retire my corded version. Regardless, I feel we should stay the course of what was previously laid out. so I don’t know if this GDX18V-1600 is better than the Freak? I was thinking the same thing,, I couldn’t really find the model # of the rotary hammer drill. The rotary hammer model GBH18V-20N. So that would be the main reason to get it but is it better than my Bosch bulldog xtreme corded? That I don’t know myself, but I do think I’d want a cordless decent SDS-Plus also myself. Still pondering that one myself. 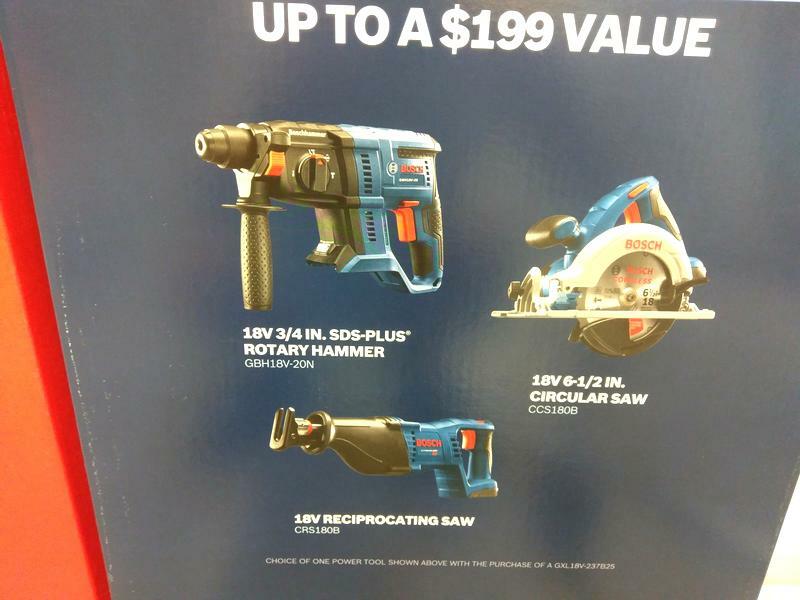 You don’t have an 18V rotary hammer? I quite like my xtreme bulldog even corded, but I just don’t know if I should get this whole kit when I don’t need most of it lol. I was hoping someone here knows about the GBH18V-20N. The Cordless GBH18V-20N Is a great rotary hammer for a cordless. I have one which we use a fair bit. I do not believe it will measure up to a Bosch Bulldog Extreme corded, but few cordless would. We regularly use ours to drill several hundred /16″ holes for Tapcons in a single day. I do not know that I would want to drill multiple 3/4″ holes but it does handle 1/2″ holes easily whenever needed e are not typically drilling more than a half dozen at a time however. In reality, the decision is what would you use most, the circular saw, reciprocating saw or rotary hammer. Thanks Kurt, that’s good to know. My main application for the rotary hammer would be drilling 3/16″ holes for 1/4″ Tapcon screws. If only a few I use a hammer drill, if I am drilling hundreds then I use the rotary hammer with the SDS+ bits. Occasionally I would use it with a chisel bit. When I run electrical from the inside to the outside I will drill 3/4″ holes through concrete blocks to pass a 1/2″ conduit as well. That’s pretty much it. Yes I know the decision for me is kind of upside down. My main consideration is actually the rotary hammer. Cir saw and recip saw already have cordless versions of and more than one so don’t need them. Even the main tools for this kit I don’t need besides the two slim pack batteries. So what I am getting out of this is the charger, two batteries and the rotary hammer. The rest of it are most likely going to collect dust. I picked up a promo w month or so ago with the rotary hammer, charger, 2 core batteries the integral dust collector for the rotary hammer and an Socket ready impact for like 3oo bucks. The rotary hammer, dust collector attachment and batteries were my needs, and the core are much better than the slim packs. I just saw that deal while picking up materials this morning. It looks like a sweet deal to beef up your arsenal. I’d love the rotary hammer. I have a corded but a cordless would be sweet! Nope. But like I said, I’m really thinking about the 1in Plus kit for my next redemption. It’s just that I can go long periods not needing to use one and I already have two corded ones.